2008년 3월 27일-4월 10일간 대학동창 부부 (오, 심, 손)는 프랑스의 파리, 몽셍미셸, 루아르 지방, 보르도, 아비뇽, 리용, 마르세유 등지를 여행하며 즐거운 시간을 갖었다. 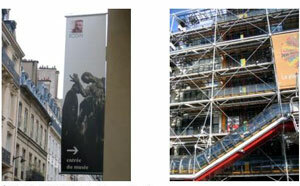 We, 3 couples (Oh's, Sim's & Sohn's), all college alumni, traveled France together between Mar.27 and Apr.10, 2008. 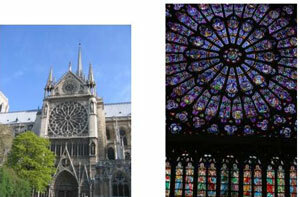 The areas we visited were Paris, Mont-St-Michel, Loire Valley, Bordeaux, Avignon, Lyon, Marseille, etc. We had great times. ∧ 파리에 있는 육군사관학교 그리고 프랑스 국기; 나폴레옹이 수료한 학교다. 프랑스 국기 는 파랑, 하양, 빨강의 삼색기이다. 이 3가지 색상은 프랑스 혁명의 정신인 자유(파랑), 평등(하양), 박애(빨강)를 상징한다. 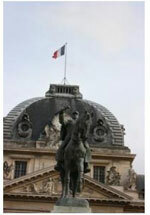 Ecole Militaire in Paris & Flag of France. Napoleon was the student of this school. The flag consists of three equal vertical bands (a tricolor) of blue white, and red. 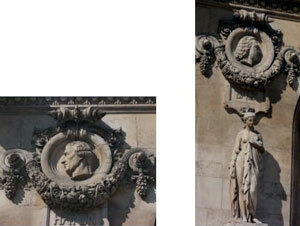 Red, white and blue have come to represent liberty, equality and fraternity - the ideals of the French Revolution. 면적, Area : 543,965㎢ (한반도의 2.5배), 전체 국토의 2/3가 평야지대. 국민, people : 60.5 million (약 6,050만명). *주요민족 : 전 국민의 91%가 갈리아 (켈트 족이고 북방민족), 로마, 프랑크(게르만 계)족이다. *사회보장제도가 잘 발달되어 있다. 근로자는 누구나 1년에 5주일의 유급휴가를 갖는다. 1주일에 35시간 일을 한다. 실업자보조금이 있다. 최저임금제도. 연금제도가 있어 직장을 그만둘 때 봉급 액수의 약 80%에 달하는 돈을 받는다. 하지만 실업자(8.7%, Newsweek, Dec. '07), 상승하는 물가, 파업, 테러 등의 문제를 안고 있다. 세금을 많이 낸다. The problem is a set of laws coddling French workers, which makes hiring and firing arduous, and pensions and benefits hugely expensive. This is why France has a chronically high unemployment rate, currently 8.7%, which is 50% higher than the average for the industrialized nations (Newsweek Dec. '07). *느낌: 우리가 왔었던 25년 전 보다는 사람들이 무척 친절해진 것 같고, 영어를 이해하는 프랑스인들이 많아진 것 같아, 큰 불편이 없었다. 경제학자 '엥겔'이란 사람이 한 달 생활비 가운데 먹는 데 쓰는 돈의 비중이 클수록 그 나라는 가난하다는 '엥겔 지수'란 것을 내세웠다. 그러나 그의 이론은 프랑스에서 만은 빗나간다. 이 나라에서는 국민이 먹는 데 쓰는 돈의 비중이 전체 생활비에 차지하는 정도가 대단히 큰 만큼, 그들에게 먹는 것은 살기 위한 방법만이 아니라 동시에 문화 생활이요, 오락이요, 또한 여가 활동이라고도 불 수 있다. 현대에 이르러서는 요일 중에는 간단한 식사를 하는 경우도 많아졌다. 우리가 여행 중에 먹은 음식들은 다 기억하지 못하지만 우선 그들의 Croissant, roll 등 거의 모든 프랑스빵이 좋았다. 포도주가 유명한 나라이니 포도주를 마실 수 있었고, 치즈도 먹었고...물은 물론 사먹어야 하고... 커피는 하두 진하여 마시기가 곤란하였고, 미국에서 마시던 소위 American coffee가 아쉽기도 했다. 점심은 소위 "panini"라는 더운 샌드위치를 먹고, 저녁에는 닭고기나 양고기가 좋았고, 여러 생선으로 된 소위 "bouillabaisse"가 인상적이었다. 소고기 맛은 덜 좋았다. "Crepes"라는 얇은 팬케이크는 일미였다. 하나 덧붙여야 할 것은 음식의 가격이 미국의 2배라고 생각하면 된다. 프랑스 음식뿐 아니라, 한국, 중국, 이태리 음식 등도 아주 좋았다. Today French are in a hurry, and for most meals of the week they will eat simply. But meals still remain an important part of French culture. We paid to drink water. We enjoyed any French breads including croissant, rolls, etc., their wines, but liked their 'thick heavy coffee' less. We wished we were able to drink 'American coffee' in big cups. For the lunch, we liked "panini", a sort of warm sandwich. For the dinner, we liked the chicken & lamb dish, and were also impressed with "bouillabaisse", a combination dish of different fish. We liked beef much less. Sure we liked their cheese, and liked best the delicious "crepes", a sort of thin pancake. Sure, it was expensive there, paying almost twice as much as in the States. 일기와 위치, Climate & Location: 파리는 캐나다의 몬트리올이나 일본의 북해도보다 더 북쪽에 있으나, 대서양의 영향을 받아 온도가 비교적 온화하고, 비도 자주 온다. 4월의 평균 온도가 6.5°C-14.5°C라고 하지만, 우리가 여행하던 4월초에는 날씨가 그보다는 춥게 느껴졌고, 비가 더러 오기도 했다. 영국 표준시간보다 1시간 빠르고, 한국보다 8시간 늦다. 비행기로 필라델피아서 떠나 약 7½시간이 걸렸다. 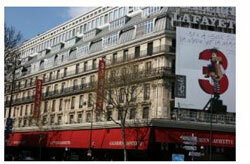 Its capital, Paris, is located further north from Montreal of Canada, or Hokkaido of Japan. However, an Atlantic influence prevails in the north-west, with humidity and warm winters. The average temperature in April should be 6.5°C-14.5°C. While traveling in early April, we felt cold. 아래에 있는 3 사진은 1)우리가 머물은 조그만 동네의 'Bed & Breakfast'이다. 하루 자고 아침식사를 포함하여 1일에 1커플 당 $142였는데...동네 이름만 있고 주소도 없기에 동네의 한 청년이 길을 안내하였다. 너무나 운치가 있고, 깨끗하고, 방도 크고, 아침식사도 정말로 좋았다. 저녁 식사 때는 정통적 프랑스 식이었고, gratin, escargot (달팽이) 등을 먹고, 이제 정말 프랑스에 와 있구나 하는 느낌이었다. 물론 주인 댁의 며누리와 할머니, 할아버지, 손녀도 만나 보았는데, 이들은 모두 친절했다. 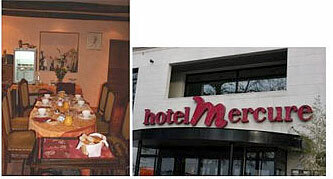 2) 나머지 날 들은 Mercure 계통의 호텔이었는데, 비교적 좋았고, 아침 식사를 포함하여 1일에 $230-$310이었다. ∧ 우리들의 'Bed & Breakfast'가 있던 촌 동네. 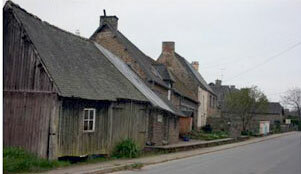 A small village, where our 'Bed & Breakfast' was located. ∧ (좌,left) Bed & Breakfast에서 아침 식단. Breakfast Table at the Bed & Breakfast. ∧ (우,right) 우리가 머물던 호텔 체인. 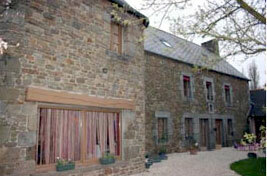 Our hotel chain in France. 1886년 6월 4일: 우호 통상조약을 체결. 현재 : 프랑스에 사는 한국인은 2005년에 13,162명이 되며, 1919년에는 35명의 한국인이 계절(季節)노동자로 왔고, 또한 한국인 입양아들이 이들의 일부이다. 북한 피난민의 숫자도 증가일로에 있다. 파리: 센 강이 흐르는 아름다운 도시 파리는 유행의 도시이며, 세계적인 예술의 도시, 관광의 도시이기에, 세계에서 가장 많은 관광객이 방문한다. 기원 전 52년에 율리우스 시저가 파리를 정복 했을 때는 시테 섬에 골(Gaul)족이 사는 어촌(漁村)이었고, 이곳에 사는 골 족을 파리지 (Parisii)라고 불렸다. 여기에서 파리라는 이름이 나왔습니다. 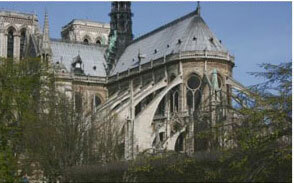 Paris is known for its fashions, art and museums, delicious food, and joie de vivre. Truly one of Europe's great cities, Paris has an appeal all of its own. ∧ 파리 교외에 디즈니 랜드 근처에 있는 마리옽 콘도미니움에서 보는 경치. 이 곳에 7일간 머물며 파리 구경을 했다. 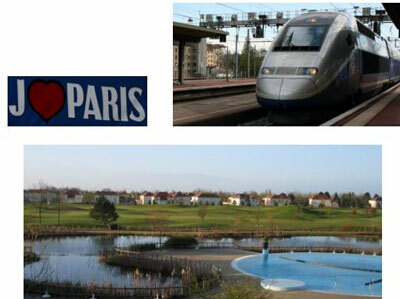 We stayed in a condominium near Paris, and commuted to Paris daily. 공공시설이 잘 되어 있어 움직이는 데는 별 곤란이 없었다. 버스, 지하철, 교외 기차, TGV같은 전국을 누비는 급행열차를 탈 수 있어 좋았다. 영국을 방문하느라고 소위 Eurostar를 타고 하루 만에 런던-파리 간을 왕복할 수 있었다. 불편한 점은 이들 지하철 을 오르고 내려갈 때 층계를 오르고 내려야 했고, 에스컬레이터가 있어도 작동하지 않는 일이 적지 않게 있었다. 시내의 길이 좁은 경우가 많았지만, 고속도로는 포장이 완벽할 정도로 잘되어 있었다. 미국에서 보는 거대한 트럭들은 보기 드물었다. 많은 차들은 소위 "smart car"를 비롯하여 대개가 작았다. 주차장의 스페이스도 매우 작았다. 가스 값이 1 갤런 당 약 $8-9이니 이해도 간다. 디젤오일을 많이 사용하고 있었다. ∧ 에펠탑 에서 보는 파리의 시가지. 날시가 흐려 사진이 잘 나오지 않았지만 멀리 개선문이 보인다. Paris seen from the Eiffel Tower. ∧∧ (左, 中, above left & middle) 리도 및 물랭루즈 쇼. 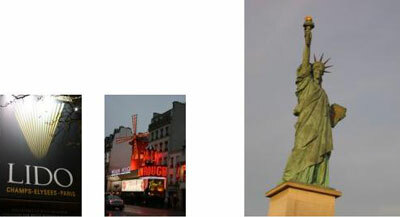 The Lido and the Moulin Rouge . 세계 최대의 박물관인 루브르를 방문하는 모든 사람들의 공통적인 생각은 '역시 세계 최고의 미술관이야' 일 것이다. 유리피라미드는 중국계 건축가인 Ieoh Ming Pei가 설계했다. 처음에는 어울리지 않는다고도 말이 많았지만, 보면 볼수록 묘하게 어울러져 이제는 루브르를 더욱 루브르답게 만드는 건축물이 아닌가하는 생각을 해본다. The glass pyramid, a new main entrance, was designed by architect IM Pei in 1989. Made of metal and glass, the pyramid enables the visitor to see the building around the palace, while allowing light down into the underground visitors' reception area. 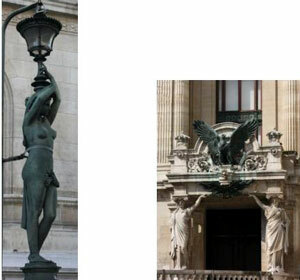 ∧ 오르세 미술관, Musee d'Orsay: 1814∼1914년까지 서양 미술계를 지배했던 작품들 (주로 인상파이전과 인상파들)이 전시되어 있다. 유명하기로는 루브르 미술관이 으뜸이지만 전시작품의 친숙도에 있어서는 이곳을 따라갈 만한 곳이 없기 때문에 오르세 미술관은 파리는 물론 세계에서 가장 많은 관람객이 다녀가는 미술관으로 알려져 있다. 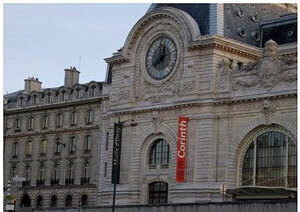 The Musee d'Orsay presents the whole range of the fine arts between 1848 and 1914, and houses Paris outstanding collection of Impressionist art. In 1986, the previous mainline railway station reopened as the Museum. ∧ (左, left) 로댕 박물관. Musee Rodin. ∧(右, right): 퐁피두 센터 (Pompidou Center)안에 있는 현대 박물관 에서는 인상파 이후의 작품들을 본다. 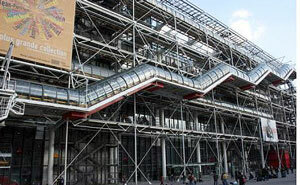 We saw the paintings & others in the Musee National D'art Moderne in Pompidou Center. ∧ 라파예트 백화점. LaFayette Department Store. ∧ 라파예트 백화점의 내부. 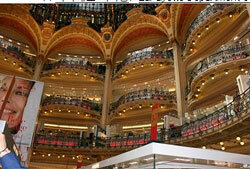 Inside LaFayette Department Store. ∧ (左, left): 파리 하수도의 시설이 잘 되어 있다고 해서 보았으면 했는데, 그 날은 열지 않는다고 해서 못보았다. Les Egouts (sewer) is a popular tourist attraction. However, it was not open for the tourists for the day. ^성 드니(St. Denis , 영어로는 세인트 데니스)는 파리의 첫 주교이면서 , 프랑스의 수호천사이기도 하다. 드니라는 성인은 3세기 무렵의 사람으로, 파리의 첫 주교로 알려져 있다. 당시 로마 제국의 한 지방에 불과했던 파리와 그 근방에서 선교를 하던 드니는 제국의 박해로 처형을 당하게 된다. 그가 목이 잘린 장소는 당시 파리 북쪽의 작은 산이었는데, 드니의 순교 이후 이 산은 Montmartre, 즉 "순교자 (martyr) 의 산 (mont)" 이라 불리게 되었다. 그런데 드니는 처형을 당하고도 죽지 않고, 자신의 잘린 목을 손에 들고는 계속하여 북쪽으로 걸어갔다. 약 6 킬로 정도를 걷고서야 성 드니는 완전히 목숨이 끊겼고, 그가 쓰러진 자리에는 곧 그를 기념하는 성당이 세워졌으며, 그 자리를 중심으로 하여 쌍-드니 (Saint-Denis) 라 불리는 도시가 형성되었다. (pomQFranc인터넷에서 인용). ^ 왼쪽의 상에서는 죽은 인간의 "영혼"을 저울에 달아서 천국에 갈 수 있는지를 판단한다. 오른쪽의 그림(대영박물관 소관)에서는 이집트에서도 비슷하게 인간의 "심장"의 무게를 재고 있다. ^ 가고일, gargoyle : 건축에서 사용하는 용어로서 지붕 처마에 고인 물을 내보내는 일종의 홈통. 중세시대로 넘어오면서 기괴한 모양의 홈통만을 주로 지칭하는 용어가 되었다. 그러나 때로는 파리 노트르담 대성당의 지붕 처마에 있는 시메르(chimere) 같은 기괴한 짐승 모양의 장식들을 가리키는 말로 잘못 쓰이기도 한다. A gargoyle is a carved stone grotesque with a spout designed to convey water from a roof and away from the side of a building. ^^ 오른 편에는 약간 틀리게 보이는 가고일이 있다. 오른쪽 밑에 '모자를 쓴 가고일'을 말한다. 건축현장에 한 감독자가 있었는데, 이 사람이 하도 고약하기에 인부들이 이렇게 만들었다고 한다. 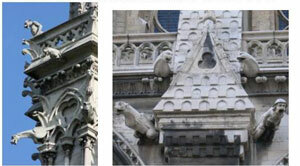 In the right, you see a 'gargoyle with hat on'. There was a supervisor at work, who was very harsh to the workers. The workers made this as a symbol of the supervisor. ∧ 멀리서 보이는 몽마르트 언덕. 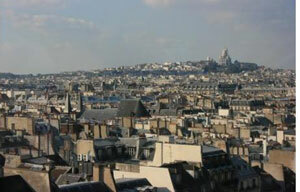 'The steep butte (hill) of Montmartre' seen from the Pompidou Center. ^^ 몽마르트 언덕에 우뚝 솟아 있는 거대한 사퀴르퀘르(성심성당). 보불전쟁(1870-71)패전으로 피폐해진 파리 시민들의 정신을 위 로하기 위해 파리시민의 기부금으로 건설된 파리에는 하나밖에 없는 백색의 돔양식의 사퀴르퀘르성당이다. 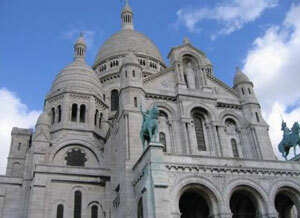 The Sacre-Coeur basilica is one of France's most important Roman Catholic buildings. This Neo-Romanesque church contains many treasures, & the Virgin Mary and Child. 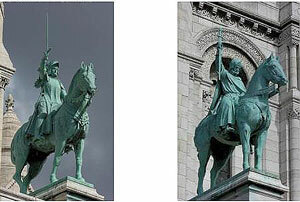 ^(左, left) : 잔다르크의 상, Young Joan of Arc. Louis IX(1214-1270): SAINT LOUIS CONFESSOR, KING OF FRANCE. 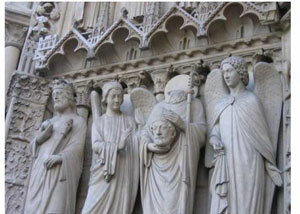 In Louis IX of France were united the qualities of a just and upright sovereign, a fearless warrior, and a saint. This crusading king (the 7th and 8th Crusade) was a living embodiment of the Christianity of the time: he lived for the welfare of his subjects and the glory of God. He became St. Louis. < 테르트르(Tertre)는 몽마르트 언덕에 있는 작은 광장으로, 유명한 화가들을 배출한 곳인데, 지금은 무명(? )화가들이 초상화를 그리고, 그림도 팔고 있다. 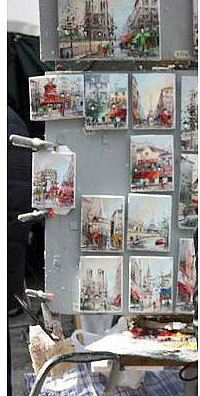 In Place du Tertre, we saw many artists trying to sell their paintings, etc. 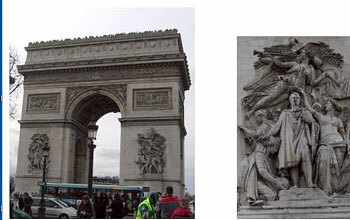 ^ (좌, left) 개선문, Arc de Triomphe. 마르세유 행진곡(La Marseillaise, 라 마르세이예즈) 은 프랑스의 국가(國歌)이다. 아마도 전 세계 모든 나라의 국가들 중에서 가장 살벌하고 공격적인 노래는 프랑스 국가 '라 마르세예즈'가 아닐까 한다. "La Marseillaise" (in English The Song of Marseille) is the national anthem of France. 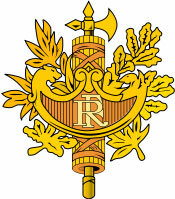 "La Marseillaise" was "Chant de guerre pour l'Armee du Rhin" ("War Song for the Army of the Rhine"). It became the rallying call of the French Revolution and received its name because it was first sung on the streets by volunteers from Marseille upon their arrival in Paris after a young volunteer from Montpellier called Francois Mireur had sung it at a patriotic gathering in Marseilles. ∧ 파리 시내의 또 다른 카루젤의 개선문: 이 개선문은 나폴래옹의 승리를 기념하기위해 지어젔다. 위에는 승리의 여신이 있다. 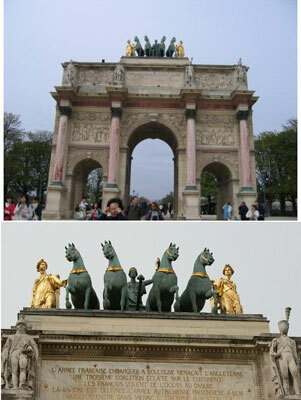 Another Arc de Triomphe du Carrousel: built to celebrate Napoleon's military victory in 1805. 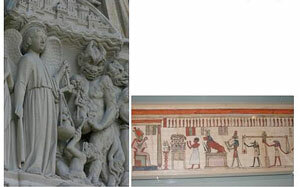 It is crowned by Victory riding a chariot. ^ (좌,left) 콩코르드 광장에서는 이집트의 룩소르에서 온 3,200 년 되는 큰 오벨리스크가 보인다. There stands the 3,200-year-old obelisk from Luxor, Egypt. ^(우,right) 분수대의 바다의 신. An oceanic god. ^ 콩코르드 광장에 있는 분수대. 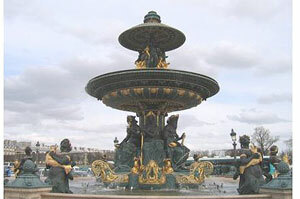 A water fountain in Place de la Concorde. 샹젤리제 거리, Avenue des champs-Elysees: 콩코르드 광장(Place de la Concorde)에서부터 개선문까지 약 3km의 거리를 샹젤리제 거리(Avenue des champs-Elysees)라고 한다. 프랑스인들이 세계에서 가장 아름다운 거리라고 자랑하는 이 거리에는 유명 부티크들이 밀집해있으며, 늦은 밤까지도 수많은 인파를 본다. 국가적으로 경사가 있을 때마다 모이는 곳이기도 한다. 세계 제 1차, 그리고 2차 대전이 끝났을 때도, 승리의 퍼레이드를 벌린 곳이기도 하다. Elysium (엘리시움, 프랑스어로는 Elysees, Elysian Field)은 그리이스 신화의 천국이자 고요한 피안의 땅으로 '엘리시움의 들판'이라고 부른다. 살아있는 동안 좋은 일을 많이 한 사람들이나 영웅들이 사후에 이 곳에 가게 된다고 믿었다. 프랑스의 파리사람들은 자기들의 아름다운 거리의 하나를 "엘리시움 (Elysees)의 들판 (champs) 의 거리 (Avenue)"라고 부른다. The majestic avenue "of the Elysian Fields"(the name refers to a mythical Greek heaven for heroes). 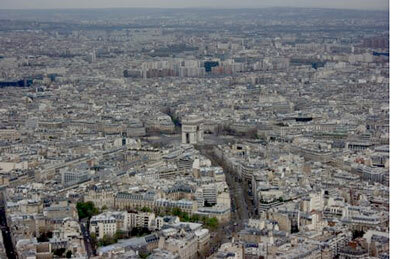 It forms a 3km(2 mile)straight line from the huge Place de la Concorde to the Arc de Triomphe. Today it's a crowded tourist trap with notorious traffic, but the style, its memories- and a special place in the French heart. National parades are held here, the finish of the annual Tour de France cycle race is always in the Chaps-Elysees, and, above all, it is where Parisians instinctively go at times of great national celebration. This was the setting for the victory parades following the two World Wars. 콩코르드 광장과 연접한 곳에 뛸르리 정원 (Jardin des Tuileries)있는데, 이곳에서는 많은 영웅, 신, 특히 강(江)의 신들의 조각품을 보았습니다. 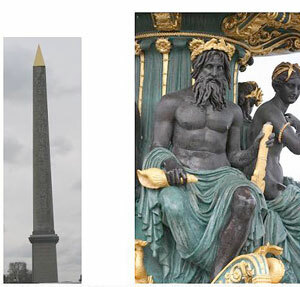 Not far from Place de la Concorde, there is Jardin des Tuileries, where we saw many statues of heroes, gods/goddess, and gods of rivers. 앵발리드, Les Invalides : 루이 14세 당시 군병원으로 지어졌으며 퇴역군인의 휴양소이기도 했다. 1840년에 나폴레옹이 이곳 교회 지하에 묻혔고 지금은 군사 박물관으로도 사용되고 있다. 금박을 입힌 돔이 인상적이다. 'Invalid'는 병약자 또는 상이병을 뜻한다. 처음에는 약 6,000여명의 상이병 들이 있었지만, 현재 약 100여명이 안되는 상이병(? )들이 기거하기도 한다. Les Invalides, now contain :1) Hotel des Invalides was commissioned by Louis XIV in 1670 for his wounded and homeless veterans, many of whom had become beggars. Nearly 6,000 soldiers once resided here. Today there are less than 100. 2) Dome Church where the main attraction in Church has to be the tomb of Napoleon. 3)Also, it is used as Army Museum. ^(좌,left) 금박을 입힌 교회. Dome Church. ^(우,right) 나폴레옹의 동상. 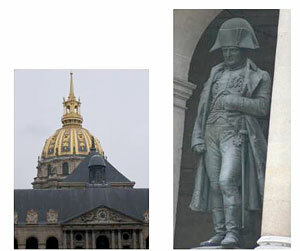 Statue of Napoleon. ^ 나폴레옹의 무덤. 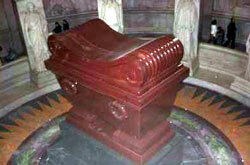 Tomb of Napoleon. ^ 박물관에 있는 루이 9세의 갑옷. 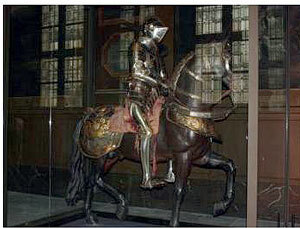 Armor Suit of Louis IX in the Museum. ∧라데팡스: La Grande Arche가 보인다. 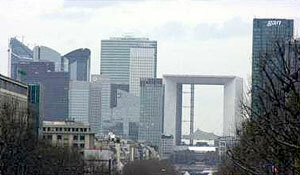 La Défense with La Grande Arche. ∧ 라데팡스에 있는 '미로'의 작품. 'Miro's Work' in La Défense. 썽트르 뽕삐두, Pompidou Centre는 파리 시내 한복판에 위치한 문화 기관이다. 석유 공장 같다는 평을 자주 듣는 이 유명한 건물 안에는 다양한 부속 기관들이 위치해 있다. 그 중 제일 유명한 것은 국립 현대 미술관 (Musee national d'art moderne)으로 이 미술관은 뉴욕 현대 미술관 (MOMA) 과 함께 세계에서 가장 중대한 현대 미술관으로 꼽힌다. 파리: 에펠탑, 오페라. Eiffel Tower & Opéra. 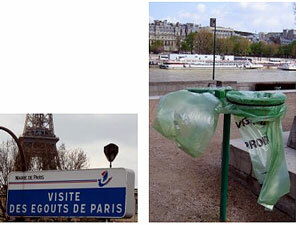 에펠탑, Eiffel Tower : 에펠탑은 프랑스 혁명 1백주년을 기념하기 위해 1889년 G. 에펠 (Gustave Eiffel)이 설계한 철탑이다. 파리의 상징이라고 할 수 있는 에펠탑에 오르면 파리 시가지가 모두 한눈에 들어온다. 높이는 약 300ｍ가 넘는다. 엘리베이터를 타면 2층 전망대에서 내릴수도 있고, 또 다시 3층 전망대로 엘리베이터를 타고 올라가서 구경을 할 수 있다. The Eiffel Tower, an immense stucture of exposed latticework supports, is made of iron, & was erected for the Paris Exposition of 1889 and to commemorate the centennial of the Revolution. The 324 m (1,063 ft) Tower was meant to be a temporary addition to Paris's skyline. 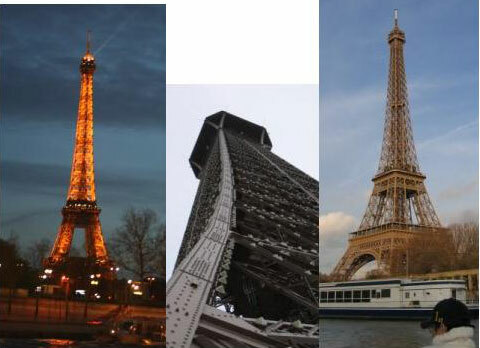 The Eiffel tower was created 1887-1889 by Alexandre Gustave Eiffel. 1875년 갸르니에에 의해 지어진 신 바로크 양식의 명소이다. 베토벤과 모자르트 등의 상이 있고 화려하게 장식이 되어있다. 현재는 주로 전속 국립 발레단의 발레 공연만 전문적으로 상연된다. 오페라는 Opera National Bastille에서 행해진다. ∧ 오페라 나쇼날 드 파리 갸르니에. 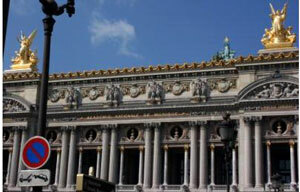 Opera National de Paris Garnier. ∧ (좌,left) Vestal virgin (베스탈)은 불과 화로의 여신인 Vesta제단의 처녀로 영원한 순정을 맹세하여 여신의 제단에서 영원히 꺼지지 않는 성화 (vestal fire)를 지키는 6명의 처녀중 하나이다. Any of 6 virgin priestesses who tended the sacred fire in the temple of Vesta (goddess of hearth) in ancient Rome. ∧ (우,right) '여상주, 女像柱, Caryatid'란 그리스 라코니아에 있었던 카리아이의 여인이라는 희랍어에서 유래되었으며, 고대 그리스 신전의 지붕을 떠받치는 부분적으로 옷을 걸친 여인상들을 일컫는다. Caryatid is a sculpted female figure serving as an architectural support taking the place of a column or a pillar supporting an entablature on her head. 파리: 알렉상드르 3세/ 퐁네프 다리. 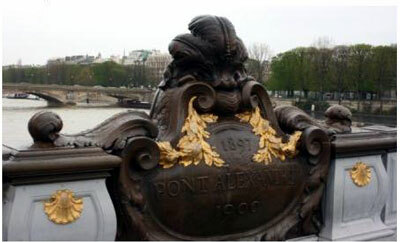 Pont Alexandre III/Pont Neuf. 알렉상드르 3세 다리, Pont (bridge) Alexandre III: 프랑스와 러시아의 동맹을 기념하기 위해 만든 다리로 러시아 황제 알렉상드르 3세의 이름으로 명명되었다. 4귀퉁이에 금으로 장식된 기둥이 세워져 있고, 센 강에 있는 다리들 중 제일 화려하다. This is Paris's prettiest bridge, with exuberant Art Nouveau decoration of gilt and bronze lamps, cupids and cherubs, nymphs and winged horses at either end. It was named after Tsar Alexander III (father of Nicholas II, the last Russian Czar, 1894-1917), who laid the foundation stone in Oct. 1896. 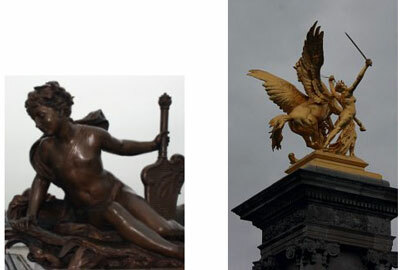 ∧ (좌,Left)알렉상드르 3세 다리, Pont (bridge) Alexandre III. ∧ (중,Middle) 다리위의 장식. A decoration on the bridge, probably a cherub. ∧ (우,right) [페가수스, Pegasus] 신화에 나오는 영웅 페르세우스(Perseus)가 메두사(Medusa)를 살해했을 때 그 피가 땅속에 들어가서 태어났다는 날개 달린 천마(天馬)로, 영웅 벨레로폰(Bellerophon)이 키메라(Chimera)를 죽일 때 도와준 천마이다. In Greek mythology, Pegasus was a winged horse that was the son of Poseidon, in his role as horse-god, and the Gorgon Medusa. Pegasus aided the hero Bellerophon in his fight against the Chimera. ∧ 리옹의 미술 박물관에 보장되어 있는 Pissarro가 그린 퐁네프 다리. 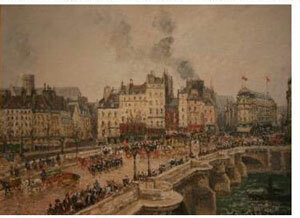 Pont Neuf as painted by neo-impressionist artist, Pissarro (kept in Museum of Fine Arts in Lyon). 센 강 유람, Bateaux-Mouches, 바또무슈, Tout Paris sur Seine: 파리의 낭만인 센 강의 유람선 바또무슈를 타고 파리를 마음껏 즐길 수 있었다. We cruised River Seine on Bateaux-Mouches.